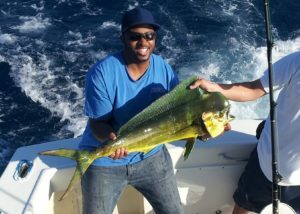 Fishing Charters off the coast of Miami produce some nice catches! Catching Sailfish is always a fun thing to do! 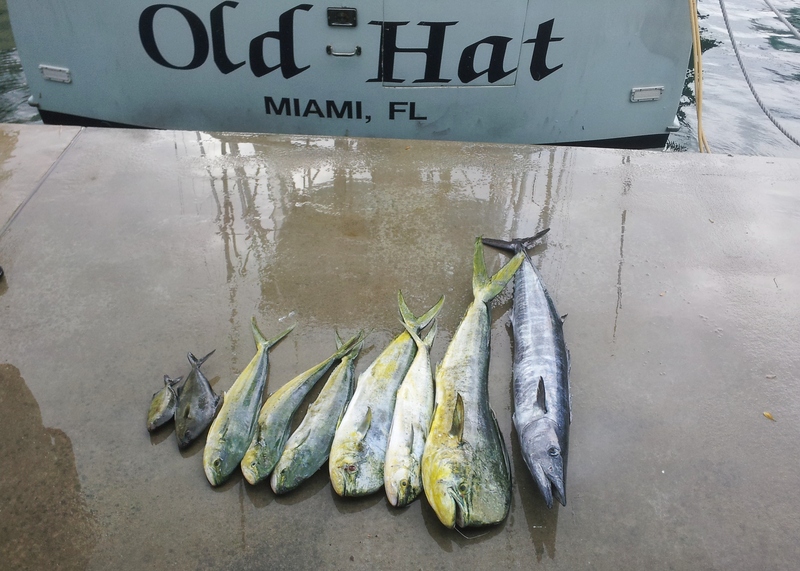 A nice Dolphin caught aboard the Old Hat! 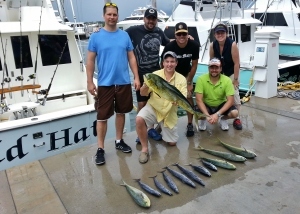 Wednesday, October 2nd we took a group sport fishing and had a lot of fun. We went offshore and found a weed line with some debris in it. 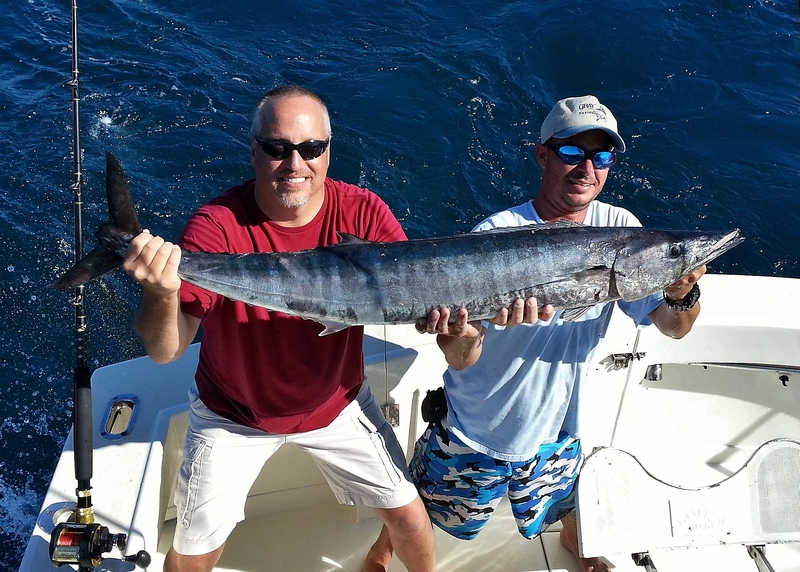 Just south of a floater we picked up a Wahoo and kept working the area until they stopped biting. They were smaller Wahoo, but ummm so tasty! 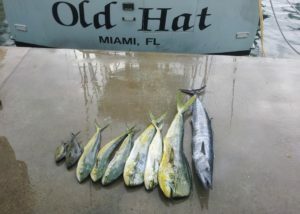 The Dolphin and Tuna were caught next to weed patches and along the weed line. On a Deep Sea Fishing Charter out of Miami Beach we had a fun time on the Old Hat! 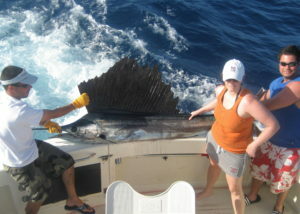 Saturday October 19th, we took Laura and Jim fishing in the morning. It was a birthday gift from Laura. We went offshore looking for Dolphin, Tuna and Wahoo, but couldn’t find a fish. 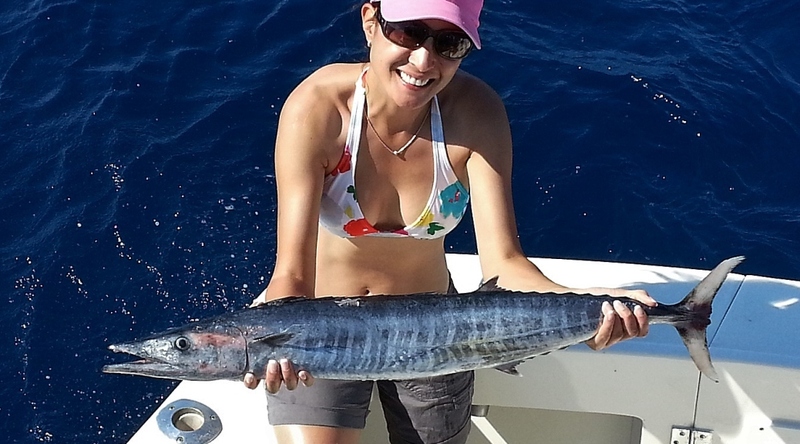 I decided to go back to the reef and look for Kingfish. Before we got there I asked Charlie to put out an additional line, a lure that I put together, on a planer, not to deep. We started heading north, outside the reef, toward the inlet. It didn’t take long. All of a sudden we had this strike on my lure. It tripped the planer, but before Charlie could reset the planer, he was on. When he started ripping line off the reel like it was nothing, then the rod started whipping up and down from the fishes head shaking, we new it was a Wahoo. The fight was on. Jim did a great job reeling in the fish. 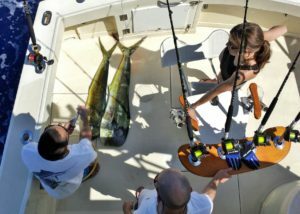 When the fish was close, I put one engine in gear, straightened the wheel, ran down the ladder and gaffed the fish as soon as Charlie had him next to the boat. Game Over! Happy birthday Jim!